They said there was adventure, honour, and fame on the frontier for those brave enough to stand against the Behemoth onslaught. From St. Avellaine to Ostia to Krolach and beyond, recruiters told tales of the legendary champion Kat Sorrel and the Slayers she trained to fight humanity’s most implacable enemy. And if you were just an average youth from a remote village, they would pay your way to Ramsgate. Ellowen heard the call and she had answered. The tingling thrill of adrenaline ran through the recruit’s veins as her transport pulled up to the Ramsgate docks and for a moment she remembered the warnings of the cynics in her village. The ones who guaranteed an early death for the foolhardy and headstrong. The ramp lowered to the dock as the ship came to a stop. Pungent smells of spices from across the Shattered Isles, the clanging of smiths at work, bold Slayers in aether-forged armour making preparations for the hunt — it all washed over her in a wave. The words of the cynics and the fearful vanished from her thoughts. As she set foot on the dock, Ellowen knew it as the first step on the path to becoming a Slayer. And she knew that today, she had found her home. The smiths are stoking their furnaces, airships are unfurling their sails, and Aether is flowing. The Shattered Isles are calling, Slayers. This Friday, we will take a gigantic step forward together into the world of Dauntless. Here’s your guide to what you can see, do, and create in the Founder’s alpha — and what’s coming in the future! The Dauntless Founder’s Alpha will run from 10 AM PDT August 18th to 6 PM PDT August 30th. For those of you who have purchased Founder-tier packs, this is your first chance to play the game and explore the Shattered Isles. The Founder’s Alpha is a preview or “Early Access” version of Dauntless. This means that there are many elements of the game that are still being worked on and that we’ll be adding much more content in the future and going forward! Instead of grinding levels or rolling a character class, Dauntless is about forging power out of the creatures that you slay and pushing your skills to the limit. If you’re not sure how to play or you get stuck, check out our Beginner’s Guide. It’s guaranteed to take you from Ramsgate tourist to savvy Slayer in no time. Looking to hone your blade and combat skills? Check out these combat tutorials from Dauntless Partner Arekkz! There are no restrictions on streaming or capturing Dauntless content from August 18th onward. Looking to stream to Twitch, Mixer, or your platform of choice? Go for it! Looking to make that epic Let’s Play? We’d love to see it! You can also check in with the members of the Dauntless Partner Program to see what they’re up to. We’ve hand-picked them to help promote a friendly and creative community. Not sure where to get started with streaming or content creation? Head over to the Dauntless Creator Conflux where you can get assets and tips to make your next creation a success. We’ve heard from Slayers around the world that they’re excited to customize their character by dyeing their armour. During the Founder’s Alpha you will have your first chance to get in and experiment with the dye system. Over the lifetime of Dauntless we will introduce dyes, expand the selection of what’s available, and rotate options in and out. To celebrate Founder’s Alpha and to learn more about how you will use these systems, Slayers will have expanded access to dyes during the test. Because all of the currently available dyes are unlocked during this test, dyes will not be included in the contents of the Chroma Cores you open during Founder’s Alpha. We will have more details on the final system at a later date! Slayers will be able to explore the first two chapters of Dauntless during the Founder’s Alpha. This means access to dozens of hours of slaying action! We will continue to add more content over the course of subsequent Betas and well into the future. We are committed to supporting Dauntless for years to come! This means more Behemoths, more gear, more quests, more islands — more Dauntless! Additionally, we will be using your feedback to shape and improve the game. So, be sure to visit the Dauntless forums and let us know what you think. Throughout the Alpha, we’ll be posting challenges and quests to the Dauntless Twitter. Defeat an elusive Behemoth with only axes, come away from a hunt without taking a hit, or see if you can post the fastest time of the day — all you’ll need to do to win is provide a recording hosted on YouTube or Twitch proving that you’ve done it! Keep an eye on the Dauntless Twitter account throughout the Alpha for these unique challenges and their rewards. Players who have purchased Founder-tier packs can claim their rewards during the Founder’s Alpha! When you log in to the game, your Slayer will have several cores containing these rewards in their inventory. 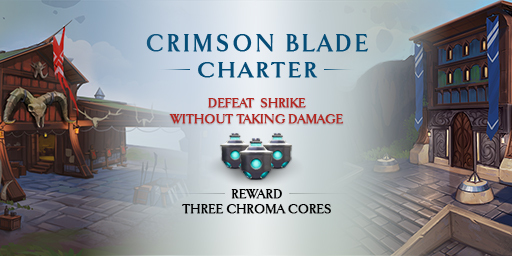 Visit any of the core breaker stations in town to open the cores and receive your rewards. In addition to getting access to the Founder’s Alpha, you’ll also be admitted to the Dauntless Closed Beta when it starts September 1st. Crack open 10 Chroma Cores and start your collection of emotes, banners, and more. If you purchased your Founder’s Pack before August 18, your name will appear in the credits of Dauntless. Be sure to let us know how you’d like your name listed in the Dauntless Credits. Check out this article for details on how you’ll be immortalized. It’s everything that a Slayer needs to get off on the right foot as you begin to forge your legend. Head over the Dauntless Forums and check out your exclusive title and forum marker, letting everyone know that you were among the first! What could be better than deploying your custom banner and letting loose your legend? Slamming it down with a Founder’s Authority, of course! This custom emote will make an impression on even the most stoic of Slayers. Light up the sky and rally your hunting party with this exclusive design. While any Slayer is able of getting a guild charter by saving up notes (in-game currency), you’ll be able to start your guild day one and secure your desired name. This is the way to go if you know you’ll be playing with friends. Guilds will have an extremely limited feature set when Founder’s Alpha starts, but we will continue to add functionality as time goes on! We are excited to have your feedback about which guild features are interesting to you. Love the stats, but want to change the look? Transmog it and give your equipment a new appearance. Please note that we’re still hard at work on the transmog feature, but that it won’t be available at launch. This feature will be added very soon. Increase the quantity (but not the quality/rarity) of drops for you and everyone in your party. While we’ll never give you a shortcut to slaying your foe, this is a good way to accrue the basic, common materials you’ll use with many recipies. Send a Slayer-tier Founder’s Pack to a friend for Closed Beta access! This grants your friend access to all the benefits of the Slayer-tier Founder’s Pack, including the ability to upgrade to a Founder-tier pack. From all of us at Phoenix Labs, thank you. We can’t wait to join you on the Shattered Isles and forge our legends together.